UpCity recently named Rivers Agency among their Top 50 Web Designers in the Raleigh area. We were selected based on how we represent ourselves online, the riversagency.com user experience, our social media presence and our prominence in organic search results. We’re honored to receive recognition for all of these qualities – qualities we help our clients perfect each and every day. While we truly appreciate each of the accolades we’ve received along the way, we’ve never measured our success in terms of awards or top 10 lists. For us, success is measured by client satisfaction and our clients’ success. We work closely with each of our client teams to produce innovative and attractive web designs that are responsive and user-friendly. And we’re always striving to deliver results that exceed all expectations. Want proof? Check out the websites we recently designed and developed for Carolina Meadows, First Bank, and Cree. Beyond top-notch website design and development, we focus on responsive web design and responsive programming that allows for device compatibility and delivers optimal viewing experiences for mobile, tablet and desktop. Our award-winning programmers are up to speed on the newest technologies, which is crucial for site success. In addition, our search engine optimization (SEO) expertise leads to increased traffic and time spent on the sites we design and develop. We create the best combination of keywords and categories for any website’s success. In this complex online world, we strive to be more than just an ad agency – we think of ourselves as a digital agency, an interactive agency, a website design and development firm, a top-notch PR company and a true client partner. 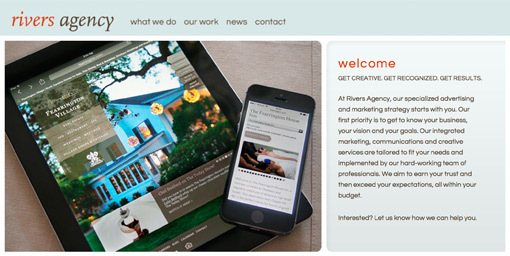 You can count on Rivers Agency for your next web project. Give us a call – you’ll be glad you did. © Copyright 2019, Rivers Agency, LLC. All rights reserved.